If ever there was a case of 'Finders Keepers' in relation to the world of pedigreed cats, the story of 'Bunch' would be it! His greatest claim to fame was clearly his sire, who was none other than the French born Red Angora/Persian, 'Napoleon The Great', who had been bred at the Chateau Fontainebleau in 1888. 'Napoleon' was owned by Mrs. Charles Weed, of New York and it is unclear as to whether he was ever at public stud, but at a book value of $5,000, his progeny would have been very well sought after. 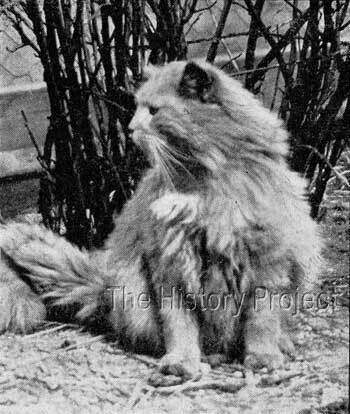 Even at the age of nine, at the Boston Show, against stiff competition from 'King Max' and others, he managed to steal away with top honours, gaining the silver cup offered for the Best Cat in the exhibition. Good reds were hard to find, although there is some confusion over exactly what colour and pattern 'Bunch' really was. He is listed in The U.S. Register and Studbook under number 37, as an "Orange Tabby, slight markings, orange eyes". In the register of the Beresford Cat Club, he is listed under his new ownership as 'Longwood Bunch' (BCC 240), as an Orange, with no mention of barring or being a tabby. His dam however, is an unknown, other than one reference to her being a Red and White, which in the case of Bunch, does prove to be of importance. When assessing all the available data on his progeny, both registered and indirect listings, it becomes apparent that on occasion he was bred to non bi-colours, but was still capable of producing bi-colour offspring. This would indicate that he was most likely a solid red, with a very small amount of barring about the legs, and probably a white locket on his chest. His photo is also suggestive of such a white locket. Nevertheless he was Red, and from the famous 'Napoleon', and when Mrs. Cora Norton was visiting New York, and found him, she did not hesitate to inform her friends, who responded by forming a syndicate to buy him. All we know with regard to a date of birth for 'Bunch' is a single reference to 'about 1894'. This would mean that his sire 'Napoleon' would have been about 5 years old at the time. His dam is merely list as a Red and White, with no further information given. It is also unclear as to whether Mrs. Norton, his purchaser on behalf of the syndicate, bought him direct from 'Napoleon's owner, Mrs. Weed, or whether 'Bunch' belonged to someone else in New York and that the purchase was an opportunistic one. The latter seems probable given the lack of information about his dam. We also do not have a date for this purchase, but if we look at the date of birth of his subsequent progeny, which range from 1898 forward, then it seems likely that the purchase took place in 1897 or 1898. 'Napoleon', although already nine years old by then, was still in winning form. So any male coming onto the market from him at that point in time, would certainly have been an appealing proposition. 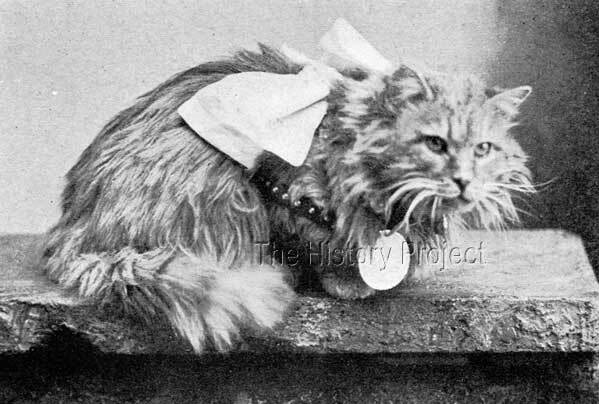 'Napoleon The Great', owned by Mrs. Charles Weed of Woodhaven Cattery, Queens Co., New York. "His mother was a very famous cat, and his grandmother was one of the grandest dams in the country. The latter apparently lived and flourished up to the age of nineteen years and consequently Napoleon the Great is considered by his owners as a mere youth." Whatever the case, he was duly acquired under the joint ownership of Mrs. Cora L. Norton, Mrs. Edith Talbot, Mrs. Chas. DeWitt, and Mrs. F.W. Story, probably with the intention of placing him at stud. There is no evidence of any full siblings, but of sire siblings, there are a small number. Helen Winslow tells us of Mrs. Weed's 'Margeurite', the mother of a magnificent Black Angora male named 'Le Noir', a son of Napoleon, valued at a thousand dollars at the age of a year and a half. 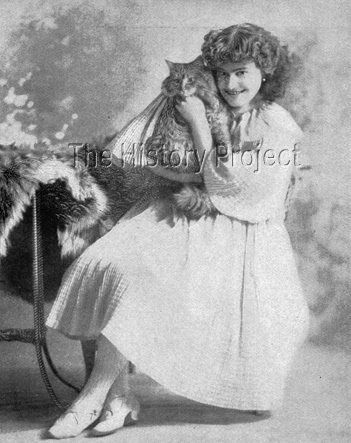 His sister, 'Juno', was apparently born in 1894 and was valued at fifteen hundred dollars. "When she was seven months old, her owners refused two hundred dollars for her. She was a tortoise-shell and white French Angora, and a remarkably beautiful creature." Helen Winslow herself gives two contradicting reports on the colour and pattern of 'Juno'. 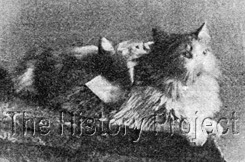 In her book 'Concerning Cats'(1900) she is described as a Tortie & White, but in an article written by Winslow two years earlier, for 'The Bazar', in 1898, 'Juno' is described as a Brown and White. A poor image of her is given with that article and if we take a pragmatic view, and given that the photo does indicate some barring coming from the face, she was probably, most likely, a Brown Tortie (Patched) Tabby and White. SCAMP: (BCC 296), a Tortie female, born 27th March, 1898, sired by 'Bunch' and out of 'Queenie'. 'Scamp' was bred by Mrs. S.Wilkinson, of Chicago, and sold to Miss Annie Hoffer, also of Chicago. She was shown and won a 4th at Chicago in 1901. Scamp however, has the distinction of being the dam of the first Orange (Red) Champion cat in the United States! This was 'Prince of Orange' (BCC 332), who was the product of a half-brother to half-sister combination , in a breeding to a son of 'Bunch' named 'Naulahka'. MADISON FIGARO: (BCC 315), a Black Smoke male, with golden eyes, born in April, 1898, sired by 'Bunch' and out of 'Lady Winifred' (BCC 254). 'Figaro' was bred by Elizabeth Knight of Milwaukee, Wisconsin, and originally sold to Mrs. W.E. Colburn of Chicago. He was later transferred to Mrs. Lucy C. Johnstone, also of Chicago. Figaro was shown for a second at Chicago in 1901. OLD FORT LOCKESLEY: (BCC 171), a Cream Bi-Colour male, born 10th August, 1899, sired by 'Bunch' and out of 'Carmen' (BCC 136). 'Lockesley' was bred by Mrs. Clinton Locke of Chicago and sold to Mrs. Helena A. Mix, of Akin, New York. His dam, was a Cream or Cream tabby with no trace of white. SICKLE: (USR 130), a Black Bi-Colour male, born 21st April, 1901, sired by 'Bunch' and out of a Black and White Persian queen, named 'Dido'. He is recorded as being a Black, with slight white markings. 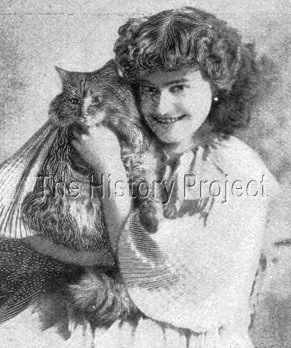 His breeder was Mrs. Julia E. Schriener. NITOCHRIS: (USR 131), a Tortie and White female, full sibling to 'Sickle' above, who is recorded as having an almost imperceptible trace of white on her neck. She appears to have been retained by her breeder, Mrs. Julia E. Schriener, of Chicago. LADY TOPAZ: (USR 249), a Tortie and White female, born 9th July, 1901, sired by 'Bunch' and out of 'Queen Josephine'. The breeder of 'Topaz' was Mrs. Geo. L. Airth, and she was sold to Mrs. Dwyer and Mr. Ethelbert Haney. UARDA: (USR 28), is registered as an Orange Tabby female, born 13th May, 1902, sired by 'Bunch' and out of 'Red Bird' (USR 474). Like her sire, she has the notation, slight markings on front legs. She is also notated as having 'deep orange eyes'. She was bred by Mrs. G.I. Airth, and passed into joint ownership between Mrs. F.W. Story, (who was a part owner in 'Bunch' and Mrs. G.S. Heinrich. 'Uarda' in her turn became the dam of 'Sappho' another Orange female, sired by 'Ravenswood Hamish' born in May 1904. 'Sappho' is also noted as having 'dark amber eyes'. Another female, a Cream, named 'Zona' from the same litter as 'Sappho' is also notated with 'very dark amber eyes'. BUTTERCUP: by 'Bunch' listed as the grand-dam of 'Queenie MacDonald V'. (USR 498). 'Buttercup' is listed as the dam of 'Buttercup II'. TOOTSIE: by 'Bunch' and out of 'Dagmar'. 'Tootsie' is listed as the dam of 'The Bumble-Bee Duchess of White Stockings' (BCC 206), a Blue Tabby female. MARIGOLD: by 'Bunch', out of 'McGinty', 'Marigold' is a male listed as the sire of 'Thistle' (USR 164), who is a Blue-cream and White. NAULAHKA: by 'Bunch' and 'Sapphire', 'Naulahka' is a male listed as the sire of 'Prince of Orange' (USR 176), in a combination with his half-sister 'Scamp' who was also sired by 'Bunch'. Photo: The Electric Light Photograph Co, Chicago.